<!-Francesco Bartolozzi, R.A. 1727-1815--> Francesco Bartolozzi. William Cowper Esqr. 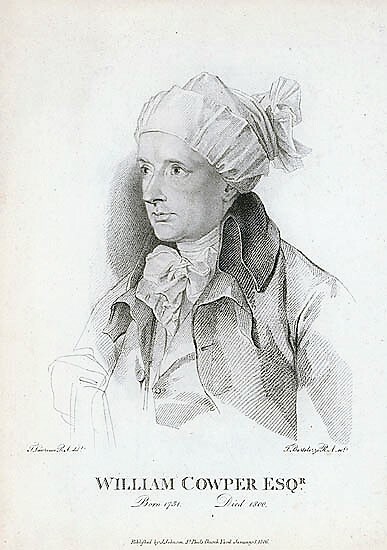 William Cowper Esqr. (After Thomas Lawrence 1769-1830). 1806. Stipple engraving. 11 x 8 (sheet 12 1/8 x 9 5/8). Published by J. Johnson, St. Paul's Church Yard, January 1, 1806. Printed on cream wove paper. Signed, dated and titled in the plate. $850. William Cowper (1731-1800) was a poet. William Blake made an engraving of the same painting for Hayley's Life and Posthumous Writings of William Cowper in 1803. The stipple engraving was published by J. Johnson. William Cowper (Hertfordshire, 1731 - East Dereham, 1800) was called to the bar in 1754, but never practiced law. In 1763 he attempted suicide and was confined for a period of two years. In 1769 Cowper moved to Huntington, near Cambridge, to lived with the family of Rev. Morley Unwin. Upon the death of Unwin, Cowper moved with the family to Olney, where he collaborated with Rev. John Newton in writing Olney Hymns (1779). His principal works include Poems (1782), The Diverting History of John Gilpin (1785), To Mary, and The Loss of the Royal George. Cowper’s last poem, The Castaway (1799) deals with his lifelong deliberation that he was forsaken by God. Allinson Gallery Index. To order or to be placed on the email list, please contact Jane Allinson. (jane@allinsongallery.com) or send a fax to (860) 429 2825.